I have a few confessions to make. First of all - Harper took 5 hours worth of naps yesterday and I'm pretty sure I didn't get anything productive done. I have so much I should be doing and I can't believe I somehow wasted 5 hours of free time??? I tried to make up for it today by getting as much cleaning as I could during her nap today. Some days during nap time - do you just want to sit on the couch and watch TV and check e-mail and do nothing???? Several of you have e-mailed me to ask how I keep my house clean and organized (and I laugh) but I try very hard to spread out the cleaning over the week. Each Sunday I make a list and give each day a few tasks. Like Monday - dust. Tuesday - clean the kitchen. Wednesday - mop the floors, etc. Or I give each day one room to clean. It makes it seem easier and not so overwhelming. Today I went with Laurie to visit her friend Beth who recently moved here and see her house. Her house is so beautifully decorated and I only took a few pictures but I'm so obsessed with window treatments right now and she had two really neat ones. This was in her kitchen - I just loved it. And this is a TV/play room and she has the neatest curtains but I LOVE the way they are hung - you can't tell in the picture but the circles are like an animal print with fringe around them. I need to do something like that. Tonight Harper tried green beans for the first time. Which brings me to TWO more confessions. I haven't been good at making baby food. I have some but I just am so lazy and/or run out of time and we have been on the go so much - it's easier just to grab a jar than to have to deal with frozen cubes of baby food. I'm going to work on that one. This is how Harper felt about the green beans. My other confession is that for the first ALMOST six years of our marriage - we have never eaten supper at the table. We always just eat in front of the TV and since Harper was born - we eat in shifts. But now that she is eating scheduled solid meals - I decided it was time to start eating as a family at the table like civilized adults. And I'm LOVING it. We ALWAYS had supper at the table as a family growing up every night and I think that's important to do. I heard this song today while I was driving for the first time in years. I sat and just SOBBED. I liked this song when it was out but it took on a whole new meaning today when I heard it and thought my baby who is turning 7 months old this weekend and growing way too fast. I don't want to take one precious moment for granted because I know she will be out of the house and gone before I know it. Also just to update you - Katie and Jason were with Reese last night when she went to be with Jesus. She was a beautiful, precious baby and I can't begin to understand their grief. Please keep them in your prayers. Thank you so much for posting this video...I am now sobbing. It really hit home. My baby turns 21 in a few days...and you're exactly right..it goes by way too fast! I just can't fathom where the time has gone. So words of advice from experience...cherish every moment. All the years are great and each one holds something new and exciting as a parent, but when they leave home, your life as you knew it will never be the same:( Still fun...you just have to re-adjust much the same as you do with a newborn. Sorry to be so long...just got pretty emotional. Also relating this video to baby Reese, and just cannot imagine their pain. They are in my prayers for peace and comfort. This past month in Parent's Magazine a mom wrote an article with advice for parents...my favorite was to clean while your children are awake so that you don't waste a nap time cleaning...I often sit and veg out during the quite time naps provide! beautiful post. Lauren practically hates food. Its frustrating but I thank the Lord for her every single day. She's a tiny little girl and I keep telling her food is Fabulous! I sobbed about Reese, just sobbed. Hey Kelly! JUST an fyi, HEB has Tyler Florence's organic babyfood that is really good! My daugther, Sophie, who's the same age as yours loved everything she's tried....neat flavor combinations, not just your green beans or sweet potatoes. You should try them...they come in these neat pouches, too. I made a video when my son graduated high school with picture from a baby on up and used this song with it....tear jerker!!! But it does go by so fast! He too will be 21 in just a few short days and I just can't believe he is half way thru college..(tears!!) so love on Harper everyday, it goes by so fast! Reese gets to see Jesus.Face to face in all His glory. I know her parents will miss her. My heart aches for them. YES! There are definitely days when I just sit on the couch and watch TV or surf the internet. If I didn't I think I'd go nuts...you have to have some YOU time! We didn't start eating at the table for dinners until we moved here. We always sat in the living room and ate at the coffee table. When our first son started eating, we'd turn off the TV (unless DH was watching sports). Until then, DS just didn't sit well at the table and we just really didn't like our dining area very much anyway! Love seeing pictures of Harper and seeing what she's doing...our second son, Colten (born Jan 27) loves looking at her pictures too! Sometimes you just need to sit! Don't feel bad for not being proactive yesterday!! You are a good wife and mom!! Thank you for linking to the Rowe's blog, I loved seeing the GORGEOUS angel I have been praying for. I am so sad for her family, and I definitely will continue to pray for them. I don't feel like I got much of anything productive done today-some days are just lazy days. And I am with you on the baby food thing. I always thought that I would make mine, but those jars are just so convenient! 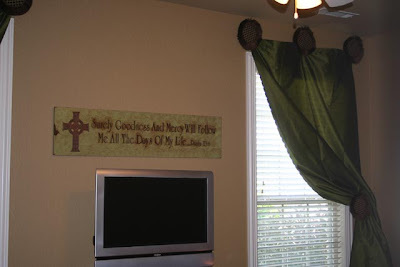 I would love to know if your friend made her window treatments or where she got them-they are precious! Oh girl, my son takes 4 hour naps everyday, and most of the time I am here or catching up on the DVR. Momma needs some momma time! And we've been married for 6 years too, and we are bad about eating in front of the tv. As soon as I'm not spending my meal time dicing bits of food I plan to move us all to the table. Lady- you are not alone in any of it! I love that song by Mark Harris. So much so that it's my ring tone! It makes me think of my boys every time the phone rings! My heart has an unbearable ache for Reese's family. I will lift the family in prayer. Happy 7-month old birthday, precious Harper!!! I adore seeing your adorable smile each day on your Momma's blog. Hugs!!! Bless your friends in their time of emptyness. I unfortunatly know their pain and hurt. I too lost an infant. 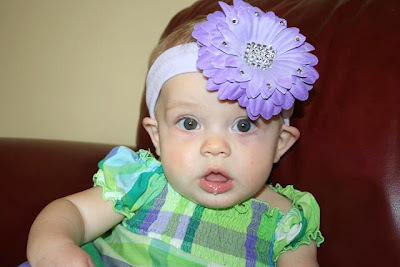 Lila Rae, my baby girl, was born with HypoPlastic Left Heart Syndrome (HLHS) and died at 6 weeks. I love Jesus with all my heart and couldn't understand why my husband and I would be put through so much pain. Please let your friends know that Jesus loves them and all they have to do is lay it at His feet. It WILL take time. Be patient. God will send His PEACE. My prayers go to them and you. God bless you for being such a loving friend. Did your baby food confession come from our conversation with Christen at Rick's? Haha! Confession: I'm not making much baby food anymore either. And I probably won't now that I'm going back to work! I think we're still good mamas! We often eat at the kitchen counter.... but, on weekends we ALWAYS eat at the table = as a family! :) I grew up NEVER eating at the kitchen table and always in front of the TV and Mike grew up ALWAYS eating at the table - every night... we've found a happy medium!!! I am just so so sad for Reese's family. Oh my goodness...I can't even imagine the grief. I think it is so important to eat together at the table, too. We have always done that and it is such a great family time! I hugged my daughter just a few minutes ago. She's 18. I'm so sorry for your friends' loss. It one of the hardest things to go through. Unfortunately, I've BTDT, too. When Ii'm working I clean and do other household chores while my darling naps. But since school has been out for summer I've found myself being lazy and saying it can get done tomorrow, and well it can. You've got to be selfish sometime. Eating as a family is SO important. I did it as a child and continue it as a mom. We eat as a family EVERY night at the table. I just hope Olivia appreciates it as much as I did when I was younger. Hey Kelly! You don't know me, but I am Robyn and Beth is one of my best college friends. She called me tonight and told me that I might be able to find some pictures of her new home on your site!! I have been asking her to take some pics of her new window treatments for me, so I was so happy that I could log on and see them on here!! She also told me that you knew my SIL, Tenille. WOW...small world. She is married to my brother, Russ. I am a native Arkansan that has been transplanted to Texas!! So sorry to hear about little Reese. I will add that family to my prayer list. Your daughter is so cute!! I have a 3 year old & I have MANY days were I just sit & do nothing during nap time. You need that time for yourself...some days. I also use a plan I found on www.flylady.com....she divides the house into 4 zones & you do little goals each day for short periods of time. It has helped me keep my house picked up in a lot less time! Well, I can't even listen to that song right now because my baby is going to be 5 months this weekend and I absolutely can't believe it. Time just flies! And I also can't believe you were blessed with 5 hours worth of naptime in one day!! I might get 5 hours over 3 or 4 days! I read an article in Parents magazine with tips for moms. One of them was to do all your chores when the babies are awake because it's just soul crushing to have to use nap time to mop the floors. Ha! Enjoy the naptime! Rest in PEACE sweet baby Reese. Comfort your mommy and daddy and help the Lord heal their hearts. Making baby food is something that first time Mom's do--right when their babies start eating solids...and then they get real and used the jar stuff (for all the reasons you mentioned and frankly most babies like the jarred stuff better.) Don't beat yourself up! Just be a good Mama, spend the time you would be making food laughing with Harper, and feed her healthy things (even from a jar!!). Here's a tip....When you are in Gulf Shores, go to Winn Dixie and get some Beechnut baby food. It's so good, I try to make mine this time around, but the times when I need a jar, I use that and it's great. And you can't get it around here, so stock up. Both my girls loved the pineapple ham and their oatmeal is the BEST! My heart aches for the family of baby Reese. I will pray for their healing. Thank you, Kelly, for posting that song. My baby is starting high school in a few short weeks. As he walked onto the football I cried, just as I did watching that video. It goes by so fast. I remember when he was born and we almost lost him.....now it blows me away to realize I only have four short years with him. I'm so proud of the man he is becoming. I agree with the other commenter....cherish every moment. It flies by. Thank you for reminding me that all this hard work is to give him wings. Love your confessions!! RIP Reese! Praying for their family! I used Find Your Wings as one of the songs in our son's video DVD for his 5th birthday this past week. I can't believe he's getting ready for kindergarten! As for green beans, Caleb would only eat one brand of those. When I tried a different brand he wouldn't eat them! Don't let anyone let you feel bad. You're a great Mom!!! REALLY!!!!! I had to buy some jarred food for our trip to Alabama next week and I did some research. Earth's Best is BY FAR the best to buy. The FDA has the same regulations for baby food as they do adult food. So (just like with regular canned stuff) there is a percentage of BUG particles, pesticides and ROTTEN fruits & vegetables they still allow in jarred baby food...GROSS!!! But Earth's Best seems to be conscious of that, and plus it's organic. Either way you're a wonderful Mother and don't let anyone tell you different!!!!! Now go get some sleep! My heart goes out to sweet baby Reese and her family. I will keep them in the forefront of my thoughts and prayers. My heart is with them! It's been a long time since I've commented although I read everyday. I relate to so much in this post. We always ate in front of the TV until our oldest turned one. He started kindergarten yesterday (where did the time go? )and I'm trying to figure out what I should do with my "down time" while my youngest naps. It's been awhile since I've had "me" time. A tip on the homemade baby food thing - pureeing fruits is the easiest. Stick with that and don't sweat the rest. Kelly, It looks like my baby was trying green beans for the first time Harper was! LOL I just made a post about how he HATED green beans! How funny. Ohh... ohhh is Lauries friend Beth, Beth B.? 3 Girls from Ohio? My old and best friend Beth moved there not too long ago and I would love to see her and have lunch with you and Laurie... maybe I should plan a trip! Baby's Reese's family is in our prayers! Poor parents (of Reese). How sad! The song "Find your Wings" is one of my faves. I used it three years in a row on my kindergarteners slide show at their graduation. The parents bawl every time. I'm pretty sure every mom has confessions that are extremely similar to yours! I know there were...and still are days that I don't feel like doing anything when Grace is napping!! And...it's completely ok. You've gotta have time for yourself to just relax!! And my heart is just hurting for Katie and Jason right now. I can't even begin to imagine the hurt. You bless me and encourage me every day. I've been thinking too about how fast time is flying and how quickly my little one is changing. It makes my heart hurt just a little, but I'm so thankful for God's provision, blessing and health for this little person. Isn't it amazing that God gave us such treasures to shape and mold for Him? The only baby food I made was butternut squash and sweet potatoes. Microwaved and then pureed in the Magic Bullet. Everything else including all fruits were not cost effective at all. Also, I always mixed the green beans with a yellow veggie. My Kate would never eat them straight. I will continue to pray for baby Reese's family. Can't even imagine that heart ache either. Blessings. I am praying for your friends Katie & Jason. My heart aches for them in losing their baby Reese so suddenly. May the God of all comfort give them peace in the midst of this terrible circumstance. Oh no how sad about the baby. We are praying for Katie and Jason here in California. DO enjoy every moment. My oldest is a senior in HS this year and I don't know when she grew up! 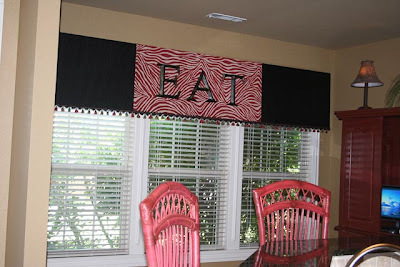 Love the house ideas, especially the window treatment in the kitchen! Very cute!! You should never feel guilty for having some free time!! I almost never get anything productive done when I am lucky enough that both girls are napping. That is your time to do whatever you want! My husband and I used to always eat in front of the TV. When our oldest was able to sit with us, it was still hard not to watch the news. I think as they get older, it becomes a lot easier because you can have conversation with them. I do find that my oldest (3 1/2) eats better when we eat at the table as a family. It gets way more fun as they get older and want to share their day at dinner time. You will love it!! Don't confessions just make you feel all better? Me too. I think I can relate to all of yours... I've done the very same things! i LOOOOOVE harpers flower clip with rhinestones!!! so pretty! Kelly, We all need some down time. You are just regrouping, getting ready for something else. About the baby food....I fed jarred food to my boys and one is 6'2" and the other is 6'. The jarred food didn't hurt either one of them.Super Mom is a myth. We cannot do it all! Just enjoy Harper. That is more important that cob webs on the ceiling, or dust bunnies under the bed. You will have plenty of time to clean when she is grown, and that will be right around the corner. Keeping you lin my heart in Ga. I Harper sitting in a plastic tub in that photo? We haven't sat at the table either and we've been married almost 4 yrs. I so want to start doing that and when I told my DH he couldn't understand why! I grew up eating at the table and I think it's such great family time and I want my daughter to have that too. Hi In Nz life is a liitle different but similar ina lot of ways. I have recently been grappling with the how to keep the house clean and tidy whislt also caring for children etc. I 've set up a regime That includes The mantra of "do it now!" Not I'll get to that later.. and doing some thing little each day. I vacumn the whole house every second day ( and wet dust the skirting boards (base boards?) on the in between days I dust with a static duster and damp cloth on some surfaces. I like that Sunday chore planning, I might try that! I hate to say this but if we are eating at home 95%of the time we eat at the couch in front of the tv. Come November we will be married 11 yrs. My baby girl is six months old, as well, and I also find it hard to get actual work done while she naps. It is much more fun to read or check blogs! 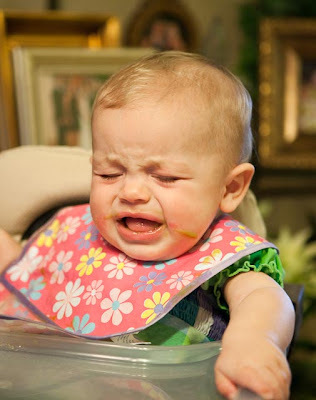 She is also not enjoying solids so much. We start green beans next week, and I am praying that it goes better than I think it will. I have been praying for Katie and Jason, and will continue to pray that they will find comfort in the God of all comfort. Thank you for being so real. I think its fine that you let yourself do nothing for 5 hours. You work hard. You deserve to relax! Just love the curtains--they add so much to a room. The music vidoe had me sobbing---my babies are now 10 and 5 (almost 6) so I am realizing everyday how time flies and how we such not take one moment for granted. 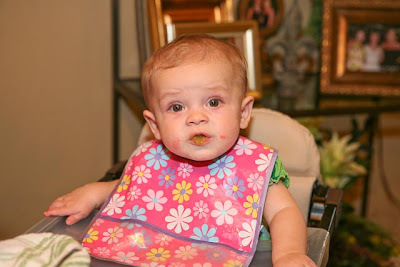 Neither of my children liked many baby food vegetables--picky eaters and one still is! Praying for Reese's family. Have a great weekend! Thank you for posting about baby Reese. I have been praying for her often since I heard about what happened. My heart has been so sad for that family and for what they are going through. Don't even feel bad about 'wasting' naptime. Sometimes us moms just need some downtime to ourselves! At least that's what I tell myself to make myself feel better when I'm not too productive during my own baby's naps. If nothing else, check out the bag holders, you know those round things that hold your walmart bags?! She makes some REALLY cute ones and they are BIG! I, too, LOVE that song! It really is a beautiful description of all we (should!) want for our kids! Love your blog, by the way... I've been a "stalker" for a while, but this is my first comment! Just recently stumbled upon this blog. Your little Harper is just too cute. Praying hard for Baby Reese's family. On a more serious note, my heart aches for Katie and Jason. They are in my thoughts and prayers this morning. If I had a dollar for everytime I read e-mail or blogs during naptime instead of cleaning my house---well, I could take that money and PAY someone to clean it! ha! We were the same way before kids...always ate on TV trays in front of the TV....now we eat at our table most of the time and it is such good family time. That song totally makes me cry, too...and my heart aches for Katie and Jason. I almost don't even know how to pray but I know God knows and the Holy Spirit will intercede. Have a good weekend, Kelly! Oh, Kelly! It was like you knew that I needed that song! Mark Harris has the sweetest songs. A lady sang that song at our church during our graduation ceremony this summer. My baby is 18mths today. Time flies by way too fast! I am very sorry to hear about baby Reese. My prayers are with them. Kelly- Why are you wanting us all to cry on our weekend? LOL! It is so true what you say about them growing up so fast. It is in no way a cliche, but God's honest truth. I am 36...I have an 8 year old and a 6 year old. It really did just seem like yesterday that they were babies. If the past 8 years has gone by fast...does that mean my daughter will be 16 in a moments breath? I can't bear to think of her leaving home. I love my babies to death, and I know you do, too. I'm listening to this song as I type, and it really touches my heart. Don't beat yourself up about taking a little time for yourself and using ready-made baby food! You seem to be doing a GREAT job as a mom, and millions of babies have eaten store-bought baby food and turned out just fine! :-) Love your blog! What a beautiful song, Kelly. Thanks for sharing. I'm so sorry to hear about Baby Reese. I can't imagine the grief but pray God comforts them greatly. I LOVE your pictures of Harper, a nd those window treatments are adorable I love it!!! That's really a good idea about giving everyday a task. I'm probably too lazy to stick to it, though! There's always something to wash, put away, or dust. I should try and make myself give it a shot. Maybe our house would be a lot cleaner!! We are praying for Katie, Jason and their families. I just wanted to comment that I first heard that song by Mark Harris when I was pregnant with Emma...I LOVE that song! I made that "Emma's Song" when I was pregnant with her. I always cried when I listened to it then and still do now. This song came out the year my oldest son graduated from high school. I still cry when I hear it and watching this video made me cry again. My precious boys are 21 and 19. Hold Harper close for as long as you can. The time just flies by. Thanks for sharing with us... I love reading your blog... Don't feel bad about resting sometimes when she naps... A little hint, all us new mommy's do it... and the whole baby food thing, the have wonderful organic baby food already made up in jars for the nights ya just don't feel like defrosting the ice cube food! Ha! My heart breaks for Katie and Jason and little baby Reese and I don't even know them. They have been on my mind and in my prayers ever since I heard the story... May god be with them during this difficult time. I couldn't imagine going through something like that without the lord by your side. Confession: I just got back from Sam's and bought Gerber baby food in bulk for the first time. Why? Because I am burnt out on making baby food. I have been doing it for 6 months and I feel like between making baby food and nursing 4-5 times a day, I'm spending all my time feeding Brody. Not that I didn't enjoy it because I did, but at this point, Gerber and I are about to be besties. Confession: Brody naps for 4-5 hours everyday (1-2 in the morning and 3 in the afternoon). Now explain to me why I have a pile of laundry to catch up on and why I really need to mop today??!! Haha! happy weekend to you and who ever reads this! xo. I pretty much always do nothing but unproductive stuff during naptime. I feel like it's my only time to be able to do nothing! I also want to encourage you as a fellow struggler to not give up on making Harper's food! The other part of the story to breastfeeding a baby like you do (besides the intellectual and nutritional side)is that breastfed babies seem to do better because their mommy is willing to sacrifice and invest the hard work and time to give them the best which carries over in every aspect of their life. I have to remind myself constantly to not do the easy thing, but to do the best thing for my children. We can do it! I make Abby Lu's food for the most part and found that buying frozen veggies to steam and blend is much easier than fresh and they last longer. Maybe it'll help you too! our babes are the same age!! i have baby food in the freezer too but often just grab a jar. we too, were guilty of eating in front of the tv at first, but now, with kids (ages 2 and 7 months) we eat as a family and i'm so glad!!!!!!! 1st; do not feel guilty about the baby food. You are an amazing mother and making baby food doesn't change that. 2nd, Find your wings has been my heart song this past year with my son getting ready for college. It's broken my heart and healed it too. I'm so sorry about Reese. It literally sucked the breath from me when I read that she went home to be with Jesus. There are no words, only prayers. This song was played at my son'g 8th grade graduation video in May. I sobbed like a baby--my son was a little embarrassed.....I can't really figure out how the other mom's werent crying! Believe me if this song makes your cry now, it only will get worse! Such a touching song for every season in a child's life.